August was a fragmented month for me in terms of reading. I spent most of the month recovering from having all of my wisdom teeth extracted; the healing process was slowed a bit by trips to Las Vegas for a wedding (yay, SCOTUS!) and Spokane, Washington, for the World Science Fiction convention. 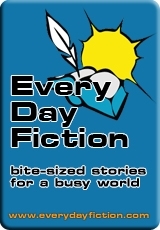 For that reason, my short fiction reading this month was weighted heavily towards flash, and I had to play catch-up several times to get back on track. And I'm happy to say that I'm there now; I read 37 stories in August and am up to 311 for the year to date. The best part is that I'm still having a lot of fun with it. Here are my four favorite stories that I read this month. In this short story, time travel exists, and is applied to fix medical errors that were made in the past -- not with better technology (it's forbidden to use new cures in the past, due to timeline issues), but simply in those cases in which preventable mistakes were made. The main character, Loren, gets permission to prevent an insulin injection being given to a non-diabetic patient, but she has an ulterior motive for requesting this particular assignment. I love time travel stories when they offer me something new to think about, and this story has several angles that I found intriguing: using time travel for this particular purpose, the effects the process has on the time travelers themselves, and the way in which society has accepted the risks of the technology because they can universally agree that people shouldn't lose loved ones when they don't have to. It's a lovely story. Sometimes humor is just the thing you're looking for in a story. The best humor, though, is wrapped around a kernel of emotion, as is the case with this charming story set in the world of Tina Connolly's YA fantasy novel Seriously Wicked. This short piece is about Camellia, a mundane girl who chafes at her guardian's wicked witch lifestyle. Camellia always feels out of place among the kids who are all learning hexes, but it turns out she has her own arsenal of weapons that she can fall back upon when needed. 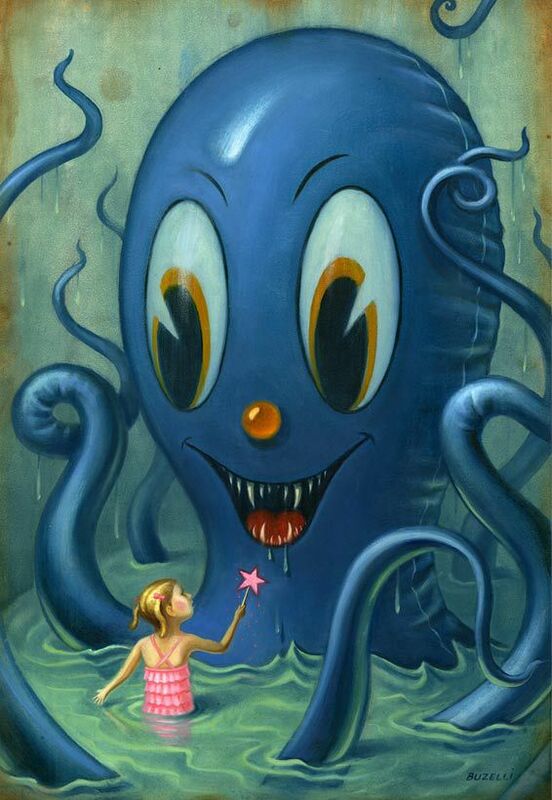 The story's illustration, by artist Chris Buzelli, is perfect. Amazon notes that Seriously Wicked is appropriate for grades 6 and up. Since I'm the cool (weird?) aunt who buys books for my nieces and nephews, I'm doubly glad to have read this short story, because now I know that the novel Seriously Wicked will be a good gift choice. And if I happen to read it before sending it on to its intended recipient ... well, I can't be held responsible for that. At only 800 words or so, this flash piece packs a lot of punch. It's narrated by a male college student, who like many others is fascinated by an object that is discovered "half buried at the bottom of an ocean trench." I don't want to give too much away, but I will say that I thought the author built suspense and conveyed emotion incredibly well for such a short piece. 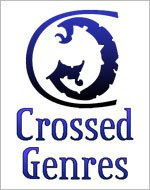 This month's issue of Crossed Genres contains three stories around the theme of "Portals." (I've not yet read the other two.) I was intrigued by this piece's title, and enjoyed its premise of U.S. post offices being open on Sundays -- staffed by only two employees apiece -- so that customers can come in person to see if they have any letters from the dead. I enjoy stories in which people matter-of-factly accept what to us would be extraordinary circumstances, and I liked the apparently random nature of many of the letters and packages. I also thought the story, without being too heavy-handed, commented thoughtfully on what we do and need for comfort when we've lost loved ones. The only thing that didn't work for me was the pseudo-"manual" structure of the story. Lots of great stories these days adopt forms such as lists, encyclopedia entries, and so on. In this case, the story has subsections titled "Appendix D - Uniforms", "Appendix E - Purpose", and so on, and the prose that follows does touch upon the named subject. But for the most part, there's no excerpt of an actual sentence or two from the manual; the sections go straight from the heading to the narrator relating events and occasionally directly addressing the reader. In a few cases, it seems as though the sentence is directly from the manual ("In case of inclement weather, the Copperlin U.S. Post Office closes when other government agencies close. Please check your local radio or television station for news of closings or delays. "), but there are no quote marks or italics and the text moves without a paragraph break into the narrator's voice once more, which made me stop and wonder whether the narrator wrote the manual. For those reasons, I would have preferred for the "manual" aspect to be either more or less pronounced. I still definitely recommend the story, however. Yep, the minute I posted about Sasquan, I remembered a zillion other people I wanted to mention having seen there, and I did actually go back to add some in, but I've since remembered even more folks, including Martha Wells, Shanna Swendson, John Husisian, Pablo Vazquez, Bill Ledbetter.... It's no coincidence that these are all Texas folks; there's something slightly surreal in seeing the same people you know from local cons at Worldcon. It makes you wonder where you are. It was really weird when we saw one of Paul's NASA colleagues there. Her name is Jenny and she was there representing the astronaut guest who had to "phone it in" (in the good way, i.e. pre-recorded messages) because he was on orbit. Best excuse for canceling an appearance ever. (He even presented one of the Hugo Awards!) But anyway, I saw Jenny and just completely blanked on who she was because she was completely out of context for me. Anyway, the other reason for this addendum is that I forgot to mention when I was at the brewery for "Drinks with Authors" that I met a civilian. He was in town for business, and had wandered in, and it was an open event so he thought it would be fun to hang around. We chatted while we waited in the (very long) line to get drinks, and he said he thought this was the coolest thing ever. He asked me what made me want to write, and I said I specifically wanted to write science fiction and fantasy because I wanted to be part of the conversation. People write books and stories. Other people are influenced and inspired by them, or don't like them and write something different in response. Other folks write reviews and can discuss the fine points of a fictional universe from dusk until dawn. It's all a conversation, a special one, and I wanted and want to contribute to it. Admittedly, this year's conversation has been more tempestuous than usual, but it's still worth the effort. 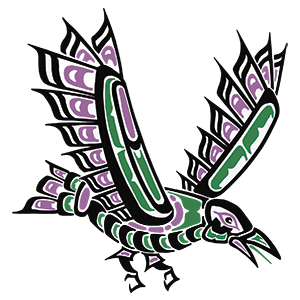 We've returned home safely from what I think was my eighteenth World Science Fiction Convention: Sasquan, which took place in Spokane, Washington last week. My first Worldcon was in 1993. I was living in Grand Forks, North Dakota, having finished grad school but still waiting for my then-boyfriend, now-husband Paul to finish up there. Although I had vague dreams of being a writer, I hadn't yet done much about it, and so I went very much as a fan the first time. I remember being goggle-eyed at everything, including meeting the fan Guest of Honor, the late jan howard finder. I met many other people at that first Worldcon with whom I remain friends to this day. I still love Worldcon. Now I find myself there as both author and fan, and I still get as much out of it as ever. These are some of the highlights for me this year. So, instead of taking the main highway, we took Route 2 through Stevens Pass, and saw some gorgeous mountains, the "Bavarian" village of Leavenworth that has been mysteriously plopped into the middle of Washington State for some reason, orchards galore, and then lots of lonely wheat fields up on a plateau that reminded us of our North Dakota and (in Paul's case) Manitoba days. There was already a little haze in the air from the fires, which would get much worse over the next few days. And in the best serendipity ever, as we neared Spokane, I turned on Paul's cell phone for the navigation, and saw a text from our Houston friend, Greg, asking if we'd gotten in yet. I said we were about 20 minutes out, and he said he was just de-planing. Ten minutes later, I realized we were passing the airport. In an "I could have had a V-8!" moment, I called Greg back and offered him a ride if he hadn't already made other arrangements. He hadn't, except that he and his plane seatmate, who was also going to the convention, were going to share a cab. Since we had plenty of room, I said his new friend could come with us ... and it was our old friend, author and Alaskan David Marusek! We truly could not have planned this if we'd tried. 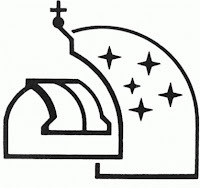 On Wednesday evening, we went to the Carl Sagan Medal Speech, given by Brother Guy Consolmagno, Vatican Astronomer. Paul has known Brother Guy for many years through the science community and I've been lucky enough to see him at several Worldcons, but this was the first time I've seen him give a formal talk, and I really enjoyed it. The title was "Discarded Worlds: Astronomical Ideas that Were Almost Correct." 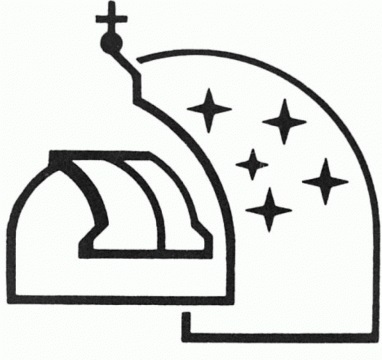 It focused on a lot of astronomical and cosmological theories that have been put forth over the centuries. Many of them made perfect sense given the information available at the time, demonstrating that good science was being done even if additional knowledge eventually disproved those theories. And that was the real point of the talk, that scientists must not only be willing to admit failure, they should embrace it because it's an absolutely necessary part of the process. Arguing over theories and trying to prove or disprove them is often what leads to a new way of thinking. I tried to get to a mix of author and fan events this year. Author events included "Drinks with Authors" at a nearby brewery, Clarion West, Fairwood Press, the SFWA suite, and the very tail end of the Hugo Losers Party (the official one, not the private George R.R. Martin one). The Hugo Losers Party was held at Auntie's Bookstore, which I thought was an inspired idea. And while I thought that GRRM made a lovely gesture in having a party to celebrate lots of folks, including those who would have been on the ballot had it not been hijacked, I felt very sorry for the organizers of the official losers party. I believe this party is usually put on by the next year's Worldcon staff, in this case the folks from Kansas City/Mid-Americon II, and I found it unfortunate that their hard work in putting on the party wasn't appreciated as it should have been, when the whole mess had nothing to do with them. Just more of the unfortunate collateral damage, I suppose. Fan-wise, I spent all of Thursday night at the Texas party, put on by Randy Shepherd (Chair of LoneStarCon 3), Tim Miller (frequent FenCon chair and Texas SMOF), and other assorted Texans. Randy gave out "hero" awards to folks who'd been instrumental in making LoneStarCon 3 the success it was; the awards were bronze-cast statuettes of an astronaut reading a book -- the very same astronaut figure that appeared on the Hugo Award base for that Worldcon, which was designed by Vincent Villafranca. That is one of my all-time favorite Hugo bases, and I thought it was a terrific way to thank the key LoneStarCon players. Other nights, I got to the Helsinki party (where I watched the last two Hugo awards being given out on the television), a New Orleans for 2018 party, and a San Jose for 2018 party. Speaking of parties, early on I made the call to stay in the convention hotel (the attached Doubletree) rather than the party hotel, in part because a lot of author events end up being held away from the official con party hotel. I was a bit worried at the distance, though, because I knew I would of course want to visit the party hotel frequently. I needn't have worried. Sasquan promised shuttles, and by God, there were shuttles! And not just tiny, infrequent mini-vans, but full-size shuttles that ran 24 hours a day. After 2 a.m. they weren't as frequent, but I was still able to catch shuttles with ease that late and even later (I stayed up until 4 a.m. my last night). Seriously, another great job by Sasquan. And Helsinki wins the 2017 Worldcon bid! Paul traveled to Helsinki for work last year and is dying to go back, and I'm always willing to see some more "World" in Worldcon even if it means I can't always attend. I thought that Helsinki worked hard, and I'm excited by the fact that Hannu Rajaniemi will be their guest. 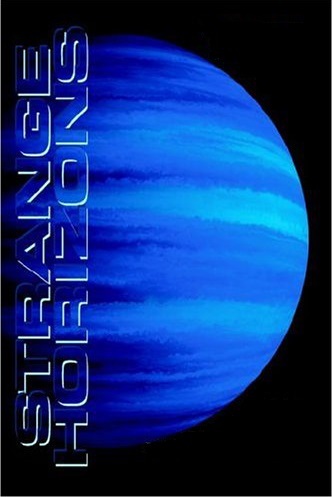 I haven't read his novels yet but am partway through his story collection from Tachyon, and I can honestly say I haven't been this impressed by a single-author collection since Ted Chiang. Winner aside, as far as I'm concerned, that was the most exciting site selection in years. I mean, it's hard to go wrong with Helsinki, Japan, Montreal, and D.C. as your choices. I ended up volunteering at the Locus table for a couple of morning shifts, which is always a nice way to see folks as they walk by. (This is often where Michael Tallan (sp?) and I usually exchange our annual lament about lack of bookshelf space.) I bought three books from the Fairwood Press table that they'd featured at their party the night before, plus two from the McFarland table. McFarland is an academic/popular culture publisher that always has a table full of tempting choices any time Worldcon is in the States. 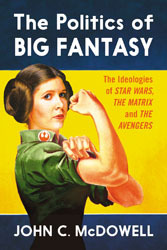 This year, I bought The Politics of Big Fantasy: The Ideologies of Star Wars, The Matrix, and The Avengers. I'm currently on an Avengers kick these days, having watched the newest movie twice on plane trips this month, and since I don't know the comics, I'm interested to find out more about that world. And seriously, check out that cover image of Princess Leia as Rosie the Riveter! There was also no shortage of jewelry, t-shirts, costumes and accessories, puzzles, and games in the dealer's room. Seriously, you can't believe the variety in a Worldcon dealers room until you've seen it. All fun and no work makes Amy ... lazy, I guess? So I tried to get some "work" in. Okay, it's not really work, but I did attend the SFWA Business Meeting, which was completely painless at only an hour long. I think it's a worthwhile organization, and important to attend the meeting so that a voting quorum can be achieved. Not quite as painless, but so worth it was attending my very first WSFS business meeting, in order to listen to the debate and vote on the "E Pluribus Hugo" proposal that if passed will change the way Hugo nominations are counted. I will not attempt to explain it in detail here, but I will say that I've discussed it in depth with two of its creators, and I think it's quite brilliant. It would allow slate nominated works on the ballot, but is designed in such a way to keep them from sweeping categories. Instead of 15% to 20% of nominators getting 100% of the five spots in a category, they would likely only get one slot, which is, appropriately, 20%. Which means that even folks who want to run slates, which most Hugo voters oppose on principle, will still get a voice, as they should. 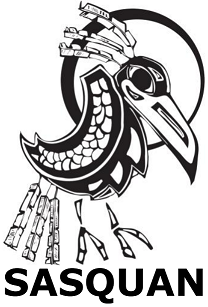 Both the "E Pluribus Hugo" proposal and the "4 and 6" proposal passed this year; this means that both will be voted on at next year's business meeting in Kansas City. While I like the intent behind "4 and 6", under which a person can only nominate 4 works in a category but 6 works appear on the final ballot, I think it can easily be gamed by two different but coordinating slates -- and in fact, that's what happened this year, since the tearful juvenile canines and the mouth-frothing juvenile canines are so intent on pointing out that they were different from each other. I urge folks who plan to attend the Kansas City Worldcon to educate themselves on this issue. And thanks to Kevin Standlee for his skillful handling of an emotionally-charged meeting. I'd intended to take advantage of Sasquan's film festival, having enjoyed Worldfest-Houston the past two years, as well as the Golden Blaster Awards as part of last year's Eurocon in Dublin. But when I looked on a wall chart, I saw that most of the slots were a minimum half hour and many were an hour, whereas I tend to prefer lots of quite-short films. I noticed one session that listed many films together, which is what I was looking for, but I had a conflict; my husband went and said it was entirely horror, so it's just as well I didn't see that one. Ugh, there's just so much to do at a Worldcon that I didn't manage a single film session. Similarly, I had a handful of panels that I'd marked down as "must-see" ... and didn't see them. I'll do better next time, I swear. And like an idiot, I slept through my alarm and missed the Codex Writers Group breakfast. That's what I get for staying up until 3 a.m.! But I did meet many of my new online acquaintances in person for the first time this year, which is always fun. The smoke. On Friday when I went in to lunch, I hadn't noticed anything. Two hours later I came out and couldn't believe how strong the smoke smell was. Then I went into my hotel and thought "Am I smelling this inside?" And then I went in the convention center and was really gobsmacked -- the entire Exhibit Hall was like the inside of a big old fireplace. Scary stuff. Luckily, the worst of it seemed to be gone the next day, but I feel for anyone with asthma -- that can't have been good for them. Best part of Worldcon, always. Just for a start, I got to reconnect with several Clarion West classmates and fellow alums, including Paulette Rousselle and Allan Rousselle, who brought their three kids, with whom I had fun talking Marvel movies. The Rousselles were kind enough to include me in a group meal with Connie Willis, and I swear, I could have spent the entire convention just listening to that woman. Between her graciousness and her sense of humor, she's one of the most fun people I've ever met. If anybody can make getting bitten by a bat funny, it's Connie. I got to see (although not enough of) the "Wharf Rats", a group with whom I've been hoisting beers (well, wine for me) at Worldcons since 1998 in Baltimore; folks in this group come from Ireland, Dublin, Texas, Baltimore, St. Louis, and California. I got to see Lee and Russ from Houston, and give them the latest update on the semi-feral kitten they entrusted us with three years ago. I got to ride not once but twice on airport runs with David Marusek, because in yet another coincidence, he ran into us right before we were ready to leave the convention. I got to see the lovely Francesca Myman (Clarion West classmate, and designer of all those gorgeous Locus covers we've been seeing lately), plus Gail Carriger, Matt and Tracy Rotundo, and Mark Boeder. As mentioned, I met many Codexians in person for the first time. I got a book signed by sometimes-Houstonian Carrie Patel, and saw her husband Hiren Patel as well. I saw Jim Van Pelt, Patrick Swenson, and Ken Scholes for the first time in a while, and got to talk a little opera with Fairwood Press author Louise Marley. I saw Rob Sawyer and Carolyn Clink, but only separately, leading me to believe they are really alter-egos of each other and can never be in the same place at the same time. I saw Lori Ann White after several years, and I got to hang out with Shoshana, whom Rob introduced us to in Denver some Worldcons ago. Shoshana makes the most amazing headdresses you've ever seen and is always the best-dressed person in the room. I also got to meet an online friend from LibraryThing named Annie, and in the small world that is fandom, found out that she'd been working closely with my friend and writer Keith Watt, who was the driving force behind "E Pluribus Hugo." And Keith brought his wife Sally to her first, but hopefully not her last, Worldcon. And (now Full) Professor Laura was there -- the one who introduced me to Keith in the first place. Seriously, your Worldcon family just grows and grows. And finally, I met Bret from Colorado, who was kind enough to bring books with two of my stories in them for me to sign, which of course was a thrill in itself. Right after I arrive at a big convention like Worldcon, I have a few hours of mild anxiety in which I wonder why I came, and I worry I won't have a good time. And as soon as I walk into the dealer's room for the first time, that feeling goes away. I get this big stupid grin on my face when I see the book dealers (especially the ones with lovingly protected second-hand books) and the hall costumes. And it never takes more than two minutes to run into a friend. You also get the pleasure of being able to tell an author in person, in an informal setting, how much you enjoyed one of their books -- and trust me, that means a lot to them. I'm interested in some pretty random things, and one of them is vintage series books for children and young adults. My favorites when I was a kid were the standard Nancy Drew and The Hardy Boys series, and I also quite liked Alfred Hitchcock and the Three Investigators. I still own all of my childhood copies of Nancy Drew and The Hardy Boys, and I've begun collecting those and some other series books in a small way, although my main vintage collecting interest is yet something different that I'll talk about another time. I also belong to a couple of fun Facebook groups in which members share anecdotes about their collecting and reading in these areas. Most Americans of my generation know that Nancy, Frank, and Joe were Grosset & Dunlap's best-known protagonists, while other folks may also be familiar with Cherry Ames, who apparently held every possible nursing job in the country, and Vicki Barr, a flight attendant who also solved mysteries. Cherry had 27 mystery adventures, while Vicki Barr had 16, and maybe someday I'll make a real effort to complete and read those sets. 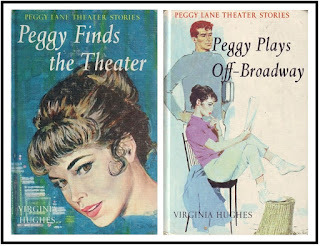 But here I'm going to talk about Peggy Lane, an actress with only eight books to her name, which makes her a little bit easier to tackle. 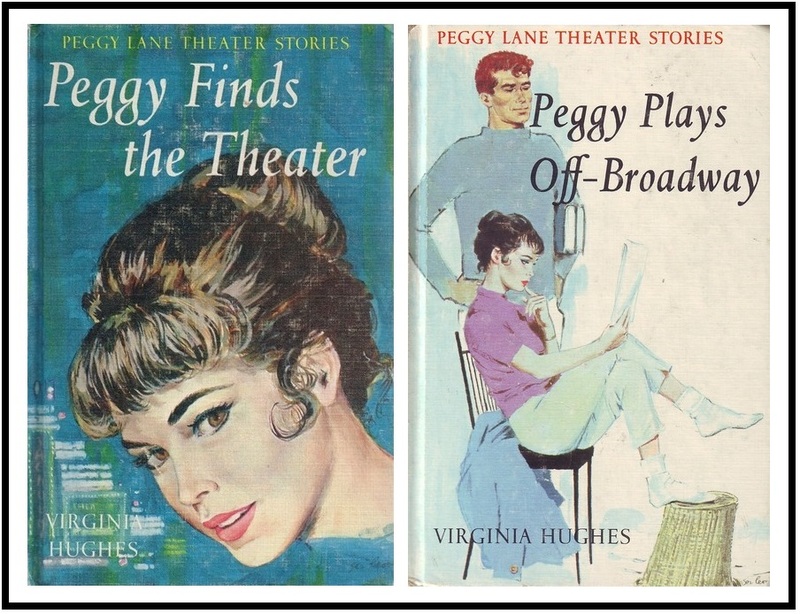 These books are not mysteries -- the official series titled is "Peggy Lane Theater Stories" -- but each book usually has a "problem" to solve, and there's often a mild hint of mystery or a slightly sinister subplot. They're credited to "author" Virginia Hughes, but were likely written by multiple ghost writers, as was Grosset & Dunlap's practice. (Many plot spoilers below) In Peggy Finds the Theater, Peggy talks her parents into allowing her to try acting for a year in New York. Convincing them is meant to be a large hurdle for Peggy to overcome, but it's actually pretty darn easy, and once convinced, her parents manage to arrange an audition for her (!) at the best dramatic arts school in New York City. They've even lined up a reputable boarding house for Peggy that is run by a retired actress and is full of amazingly friendly and noncompetitive aspiring actresses. The head of the drama school admits Peggy, even though it's only two weeks before the term starts, on the basis of her answer about why she wants to be an actress -- he doesn't even want her to read for him, so she technically doesn't audition at all. And since her parents don't think she should have to carry too much luggage from Wisconsin to New York, she even gets to buy everything new when she arrives in the city. Right off, we can see the main similarity to Nancy Drew -- everything comes easily to this young woman! Over the course of the series, she'll experience difficulties in perfecting a role, or in dealing with clashing personalities or small domestic mysteries, but never does Peggy truly have difficulty getting a job. This is due in part to her immediate friendship with Randy Brewster, an aspiring playwright. In the first book, Peggy solves the book's "problem" by literally finding a theater, without which Randy can't put on his first off-Broadway play. Available theaters are very hard to come by, but Peggy thinks to check city records and look for buildings that were originally built as theaters but are now unused and unoccupied. She finds one at which men surreptitiously unload freight each night under cover of dark; the building's owner is so grateful to Peggy and friends for uncovering this smuggling operation that he offers them the entire building at low rent to use as they want. In Peggy Goes Straw Hat, Peggy accepts the role as the contract ingénue for a summer stock theater. In this book, Peggy deals with a fellow actor who is not exactly a diva, but who puts herself first before the company. Peggy also deals with a movie theater owner determined to tank the summer stock theater because he views it as competition. I found this book a bit disappointing, mainly because it didn't have the charm I've come to expect from vintage young adult books about summer stock theater. It didn't help, for instance, that Peggy's group performs in a high school auditorium rather than a converted barn, which was something of a staple in summer stock and is much more romantic. I was also a little frustrated that Peggy is miserable about one role in which the nuances elude her, until she is so numb and dejected that she plays it without feeling anything at all, and somehow gives the best performance of her career to date. 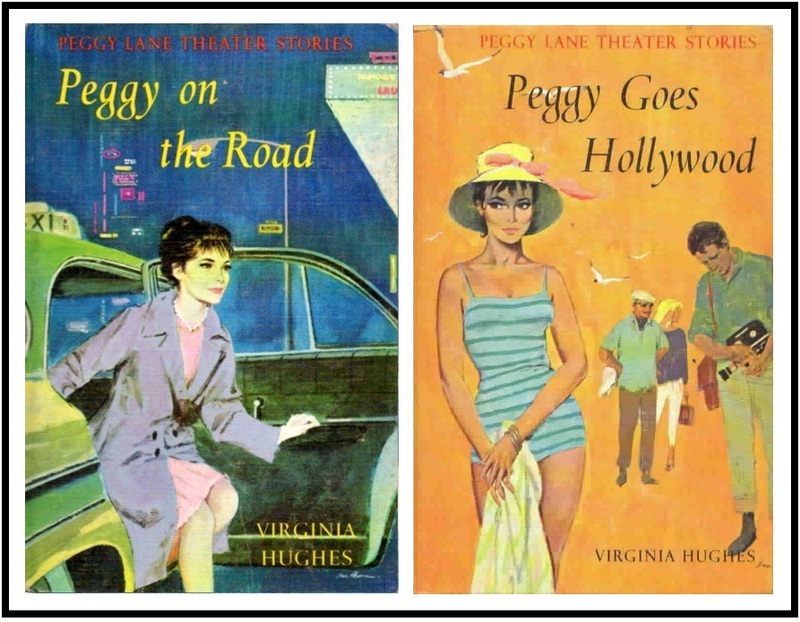 Peggy next joins a touring company of a successful Broadway show, in Peggy on the Road. The play has three generation of women in it, and Peggy is there primarily to understudy the important role of the granddaughter, although she also has a very small speaking part in the regular cast. Her main focus in this book, however, is first locating a reclusive Vaudeville star whom the producer hopes to lure out of retirement to play the grandfather (how does it fall to an understudy to take on such tasks, I wonder! ), and then navigating the muddy waters when it turns out that the man clearly has a past relationship with the play's diva-like star, who does everything she can to make both him and Peggy quit the production. The fifth book, Peggy Goes Hollywood, is perhaps one of my favorites. Notice it says "Peggy Goes Hollywood," not "Peggy Goes to Hollywood." This is because Peggy, naively listening to her rather strange agent, buys the glamorous wardrobe and agrees to contrived publicity dates with a famous screen actor. Because she's not focusing her efforts on her paying job as part of a repertory theater cast, Peggy is actually fired, and she initially doesn't get the screen role she tested for because the movie producer assumes she's a glamour girl and not a serious actress, based on all the superficial publicity she's getting. Eventually she gets her head screwed on right, and with some help from influential friends manages to salvage the situation. In the sixth, seventh, and eighth books, Peggy begins to travel, in part based on the advice of that famous screen actor from book five. 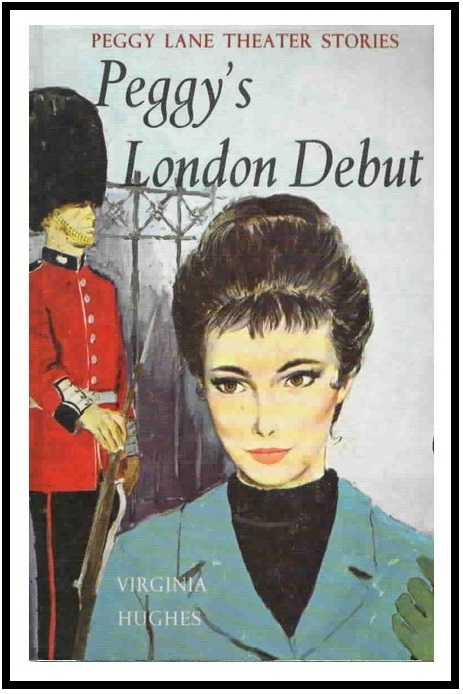 She first goes to England in Peggy's London Debut, sailing across the Atlantic on the Queen Victoria. Fortunately, Randy by now is a fairly successful playwright, and Peggy is given a role in his first play to show in England. As happened in New York and Hollywood, an apartment has been arranged for her, this time with a young British woman who aspires to be an actress but is held back by the family's ancient curse against having any association with theaters. I have to admit, the plot in this book is almost Scooby-Doo like in its silliness, with someone taking advantage of the family curse and belief in ghosts to hunt for a lost treasure. In fact, very little of this book is actually concerned with acting. Next, Peggy travels across the Channel in Peggy Plays Paris, as one of Randy's plays has been invited to represent the United States in an international theater festival. 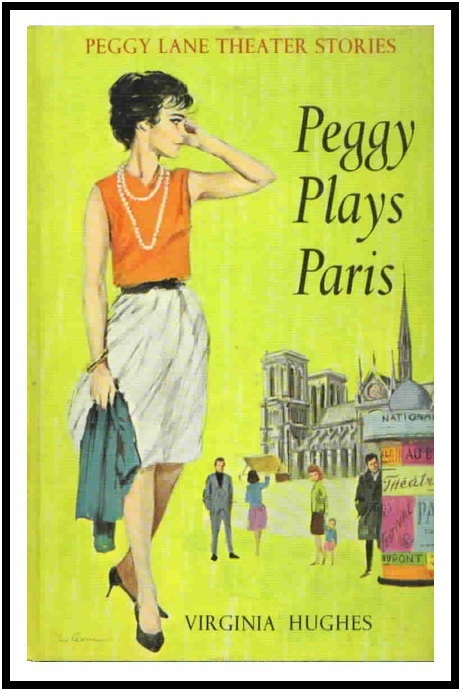 Due to a miscommunication, Peggy arrives ten days before the rest of the American cast, and has a little time to explore Paris, in the company of a highly clichéd arrogant Frenchman. Once the other actors arrive, Peggy struggles because she has only two days to rehearse a role she hasn't yet played, although she's familiar with the production. Her personal crisis comes when the director finally asks her to just imitate the prior actor's interpretation of the role rather than floundering to make it her own in too little time. Peggy is aghast, but quickly decides to put the company's interests ahead of her own. Fortunately (how many times have I used that word in this blog post?! ), the company is invited to extend their stay, filling in for a company that had to cancel, and Peggy can then use the extra time to make the role her own in the end, and knock them all dead. 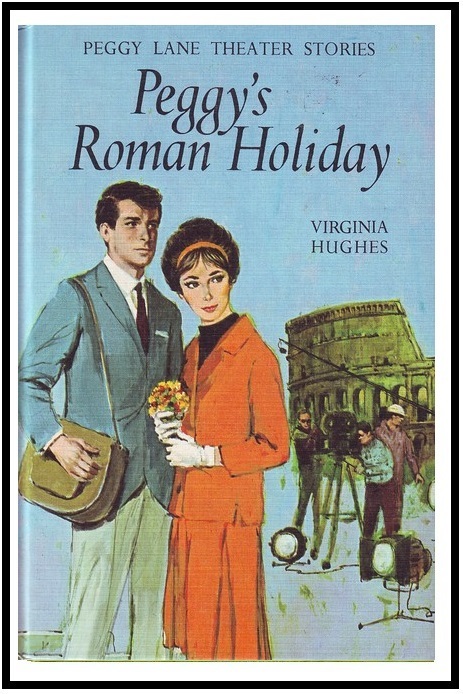 Finally, we have Peggy's Roman Holiday. At the end of Peggy Plays Paris, she was about to go off for a month's holiday to a private residence in Nice, France, where she would sit by and occasionally read lines for Randy while he worked on his next masterpiece. At the beginning of this book, we learn that a famous Italian director was also at the house, and has hired Peggy to play an important role in his work in progress, after getting her to promise to learn or memorize Italian well enough to speak the lines. So off she goes to Cinecittà, the Italian equivalent of Hollywood. This was probably my least favorite of the series. Just as the French were portrayed as arrogant snobs, here the Italians are depicted as hot-headed chauvinists and manipulative, iron-willed, matchmaking dowagers. To be fair, the book does spend a lot of time dealing with Peggy's difficulties trying to act in this environment when she doesn't know the language. But I was very much turned off by the book's central plot, which was that the female star of the film was being physically threatened by her ex-fiancé. Peggy is horrified that everyone seems to be looking the other way, but the Italians keep saying that the man has his pride, and since the woman made him look foolish to his friends by jilting him, his behavior is to be expected (including showing up on the movie set with a gun). I was also put off by the emphasis that Peggy's hostess kept placing on how Peggy was obliged to treat men -- you can't possibly hurt their feelings by rebuffing them because they are so sensitive and passionate, yet if you refuse to marry them, you are at fault because you've been leading them on! There is a very much a vibe here of "it's all the woman's fault, for being so tempting to men." Fortunately (! ), Peggy eventually comes up with a way for the star's ex-fiancé to save face without anyone getting hurt. So that situation is resolved, but Peggy is miserable because the director keeps showing his displeasure with her and implying that he's going to replace her with another actress. But three weeks after filming ends, when Peggy goes back to work on the English language track -- surprise! We learn that the director was manipulating Peggy to make her feel miserable and depressed as needed, in order to get the performance he wanted out of her. And she forgives him, because "every time a New York television producer or a Hollywood casting director needed an ingénue, the first name he'd think of would be Peggy Lane." Overall, I feel as though I haven't been, and am perhaps incapable of being, fair to this series. After all, when I read Nancy Drew as a kid, I wasn't concerned with all the convenient developments, or how easy it was for Nancy to quickly master any task to which she put her mind. So I have to remember that these books, which were published from 1962 to 1965, were meant for kids, and they're weren't intended to provide a particularly realistic portrayal of the acting profession. 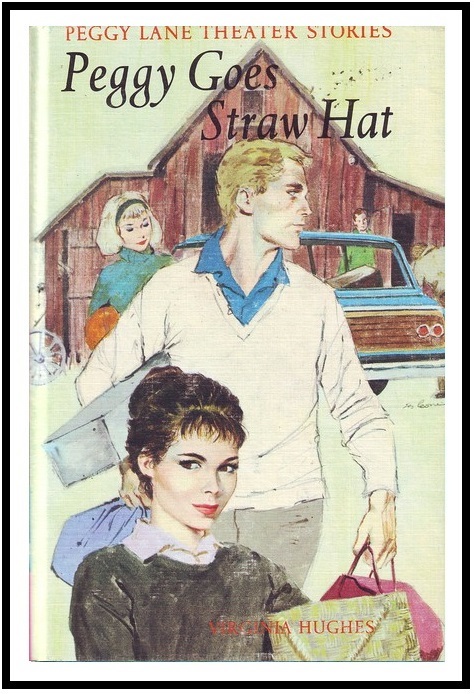 I also have to remember that this publisher's series were primarily mysteries, and so of course they felt compelled to inject some little mystery or problem into each book that wasn't necessarily centered on Peggy herself. I think I might have been able to remember all that, were it not for the fact that I've read so many career romance books from the same time period that I felt to be at least a little more realistic. But there were things to like in this series. Peggy was reminded, and reminded herself, on more than one occasion that in many cases, actors don't get parts simply because they don't have the precise look that the director has in mind. I'm glad that the series covered both stage and screen acting. I liked that Peggy was encouraged to travel and gain broader experience. And I absolutely loved the interior illustrations by Sergio Leone -- they are the same type of black and white line illustrations that we see in the pictorial cover editions of Nancy Drew and the Hardy Boys, but a bit more sharp, in my opinion. Peggy is recognizably Peggy in every single illustration in all eight books, and the pictures directly represent specific scenes. I just love the time and care that went into these drawings, and I wish we had more illustration in books being published today. It would have been nice if the series had had a definite end. Randy is essentially Ned Nickerson from Nancy Drew, although a little bit more useful. He mainly served to provide jobs for Peggy, and to give her a sort-of boyfriend even though she says in book six or seven that they're both so young and want to meet other people. Oh, and occasionally there were jealous misunderstandings, when one of them (usually Randy, of course) thought the other was too interested in one of those new people they were supposed to be meeting. The expected resolution, of course, would be an engagement by the end of the series, but the way the last book ends leads me to believe that someone hoped there would still be a few more to come out. In the end, I'm glad I read these. I'm somewhat unlikely to read them again, yet I can't quite part with my set at this point -- in large part because of the illustrations, I think.